- A regal maple spreads its branches over a rushing stream. Captivating wraparound scene continues on the back of the journal. Closes with a pewter maple leaf button wrap. The journal measures 6" by 9". Made of saddle-colored leather. 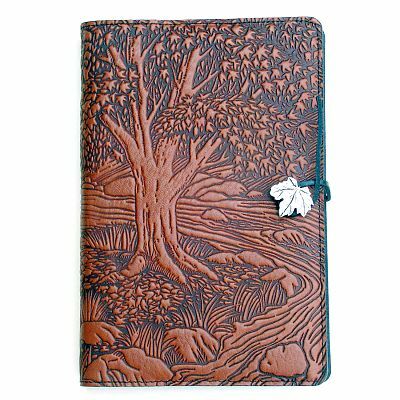 Tooled Leather Journals are made with top quality cowhide and are decorated with a pewter button that coordinates with the tooled design. 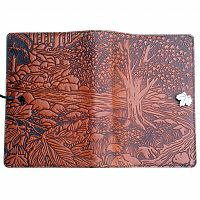 A delight to the eye and hand, they are ideal for use as diaries, travel or dream journals, BoS's, or for sketching, notes, and appointments. The blank book inserts are unlined, have 220 heavy bond pages, and can be replaced when full. Replacements are a standard size and are available in art stores around the country. 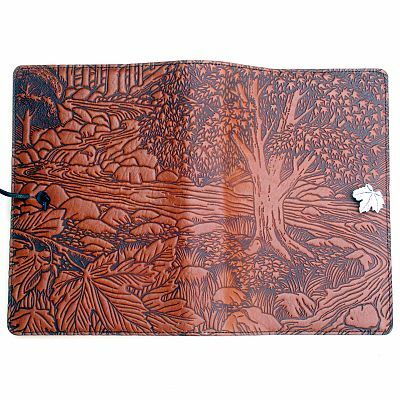 The Large journals measure 6" by 9". The Small journals measure 5" x 6 7/8". 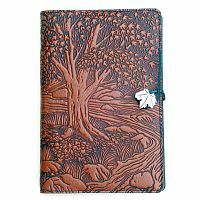 Do you have any other questions about our Large Creekbed Maple Leather Journal?